Kerala is the only Indian state of beaches, backwaters, lakes, houseboats, wildlife, waterfalls and watersports. Snake boat races are major watersports of Kerala. 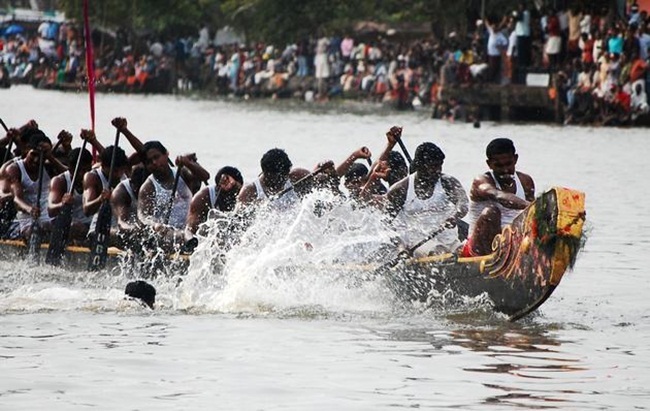 Boat racing is not just a sport but a traditional festivity, unique to the religious being of Kerala India. Though more or less religious in origin, the Kerala boat races used to be held as part of competition or settlement between two rival communities in the bygone eras. Boat racing being organized during temple festivals throughout the year, every month and every season is the best time to visit Kerala for tourists as well as sports enthusiasts. 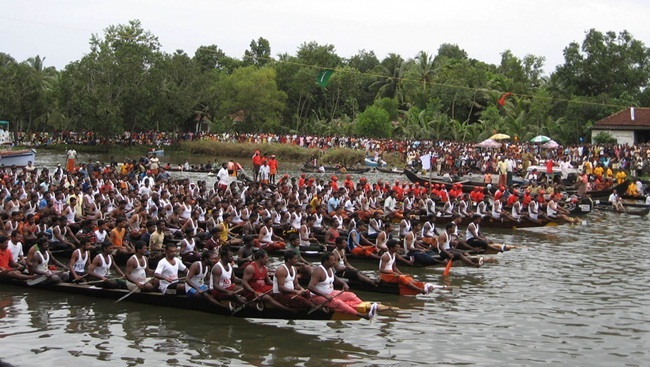 An interface between sports and festivity, most of the boat races are held on Kerala backwaters. Indian Eagle shares some tidbits of the most popular Kerala boat races. One of the boat race festivals in Kerala, the Nehru Trophy Boat Race is a visual extravaganza on the backwaters of Punnamada in Alappuzha district. This boat racing in Kerala is a rowing competition between several groups of oarsmen for the Nehru Trophy. The Nehru Trophy Boat Race owes its origin to a visit by Pt. Jawahar Lal Nehru, the First Prime Minister of India. A snake boat race was held to welcome him. He was so enthralled by the event and the gusto of the participants that he announced the Nehru Trophy to award the winning team. Since then, this Kerala boat race has been an annual event. The trophy is a silver replica of a snake boat. The Champakulam Moolam Boat Race on the Pampa River in Alappuzha district is one of the tourist attractions of Kerala India. The venue of this Kerala boat race is the Pampa River at Champakulam in Alappuzha. The shape of boats with a raised end at the back like the hood of a cobra is unique to the way the Champakulam boat race festival is celebrated to commemorate the age-old event of bringing a new idol of Lord Krishan from Karikulam Temple in Kurichi to a temple at Ambalappuzha by boat, at the behest of King Devanarayana of Chempakasseri. June or July being the month of this festive watersport is the best time to visit Kerala. Payippad Jalotsavam is not just the best snake boat race in Kerala but also an attraction of Kerala tourism in South India. A grand festivity for three days, Payippad Jalotsavam is held on the Payippad Lake at a distance of 35km away from Allappuzha, in honor of the presiding deity of the Subramanya Swamy Temple. According to the folklore, the inhabitants of Haripad Village had dreamt that an idol of Swamy Subrahmanya was lying on the bed of the Kayamlulam River before the temple was constructed. The idol was surprisingly found there and brought in a boat to where the temple is located today. 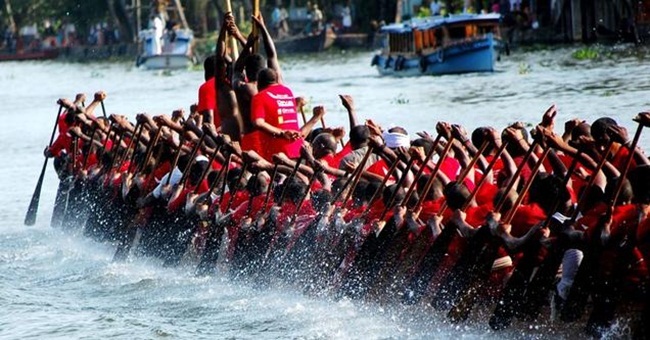 This Kerala boat race is annually held to commemorate the event in the month of September. Bull Racing in Kerala is not just another adventuresome sport! It is one of the most offbeat sports in India. Kerala’s bull race is India’s answer to Spain’s bullfighting. This furious sport is an extraordinary show of men’s physical strength in contrast with the beastly force of bulls. – Indian Eagle. The oldest boat racing in Kerala, Aranmula Uthrattadi Vallamkali is part of the cultural extravaganza during Onam Festival in August. The Kerala backwaters brim with excitement and enthusiasm of the rowers in hundreds, who oar the boats at a breakneck speed making it a gripping spectacle of energy and madness on the Pampa River. Dedicated to Lord Krishna and his devotee Arjuna, Vallamkali is characterized by embellishment of boats with ornamental umbrellas and flags. 25 folk singers also accompany the rowers during the racing festivity. The racing boats are locally called ‘Palliyodams’. Monsoon being the season of Onam Festival and Vallamkali celebration is the best time to travel to Kerala. Onam Festival of Kerala will commence on August 15, 2018. This harvest festival of India is celebrated through different ceremonies including Vallamkali Boat Race. It is not just the best time to visit Kerala but the time for homecoming. We at Indian Eagle Travel book cheap flights to Kerala and have the best airfare deals for the rest of India. Click the button below to get the cheapest flight tickets.